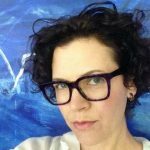 Gallagher, R. M., A/Prof. (2019, April 17). Latest News: Pieces of the Continent. 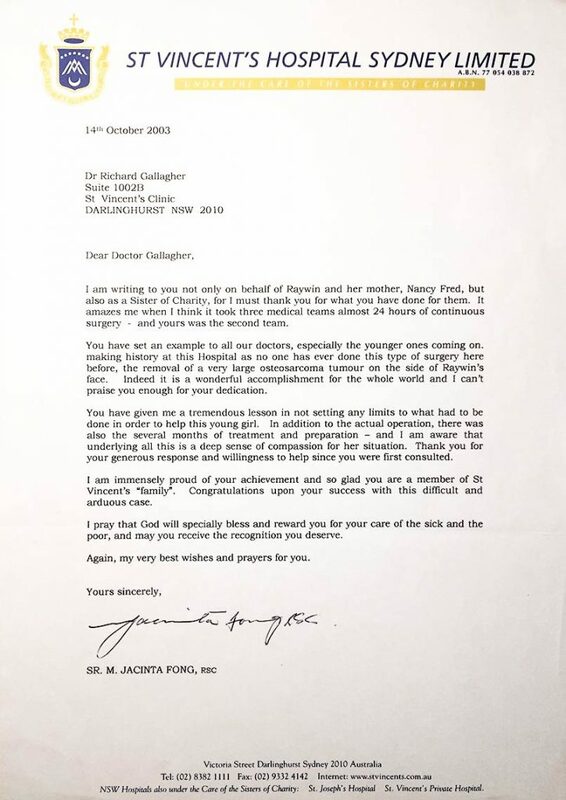 Gallagher, R. M., A/Prof. (2016). Reaching across the strait: A surgical lesson from Papua New Guinea. ANZ Journal of Surgery, 86(9), 634. 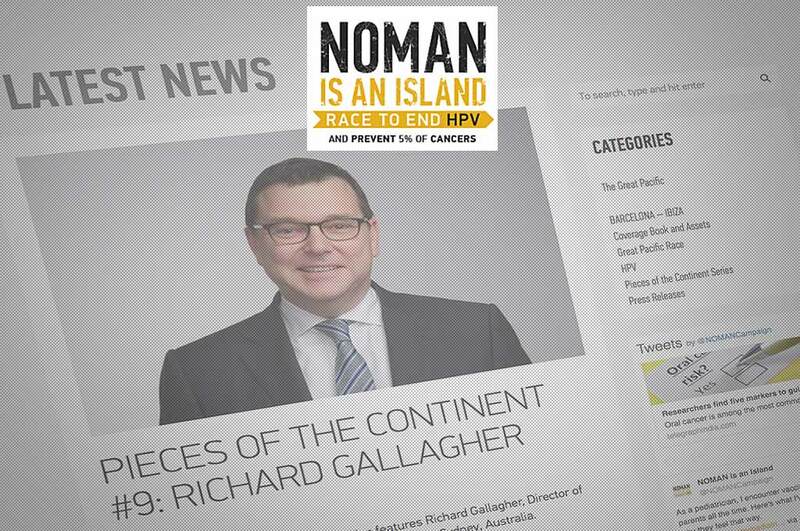 Prioritising Aboriginal and Torres Strait cancer services. 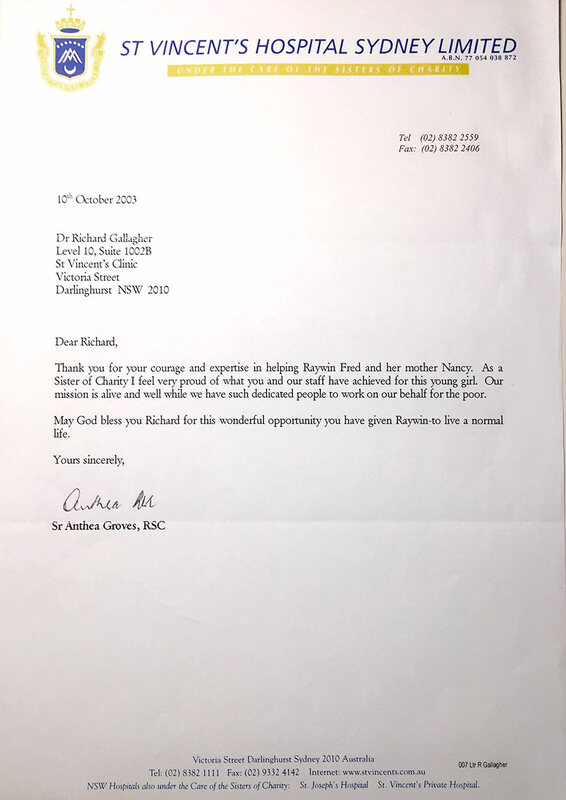 Gallagher, R., A/Prof. (2017). A step towards Closing the Gap. Deadl Yarn’n, (2), 17. Winning the 2018 NSW Premiers Award for Outstanding Cancer Clinical Trials Unit. Celebrating Ten Years of Excellence in Robotic Surgery. (2018, Summer). St Vincent’s Voice, 4. 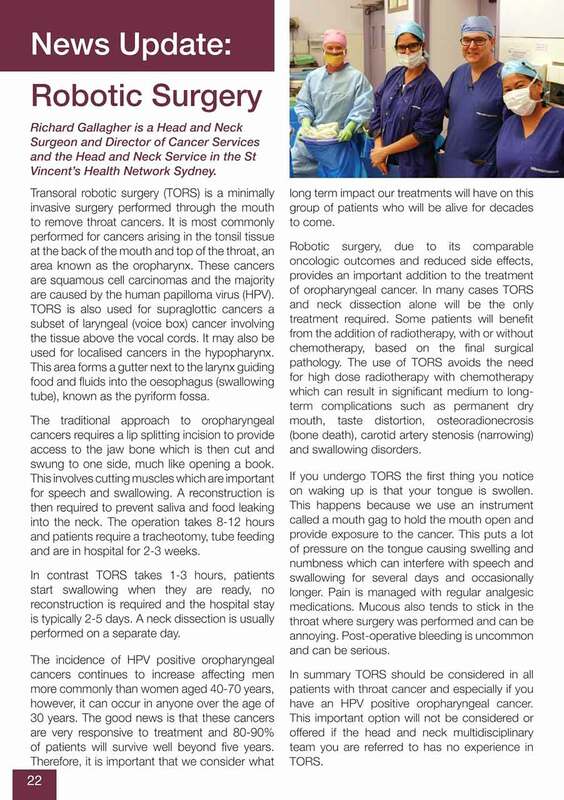 A/Prof Gallagher performs world first surgery to remove and reconstruct a woman’s damaged trachea. 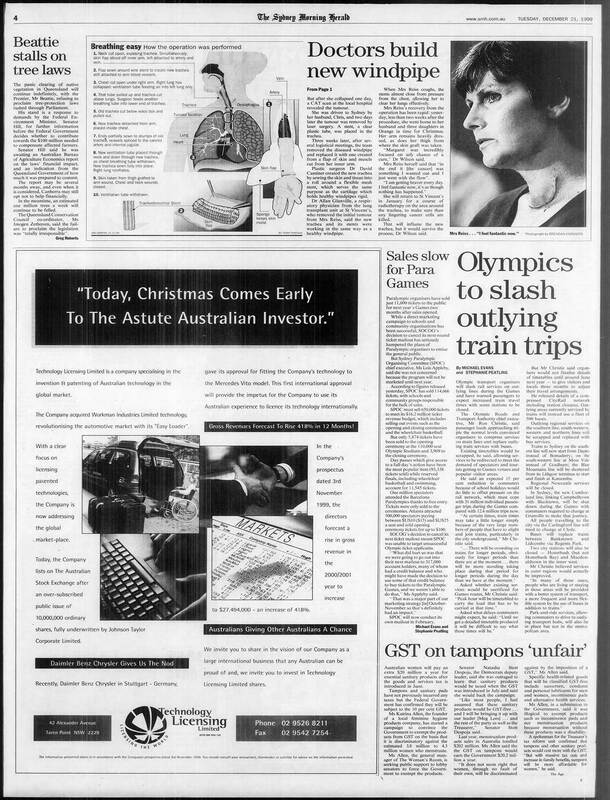 Doctors Build New Windpipe (1999, December 21), Sydney Morning Herald. 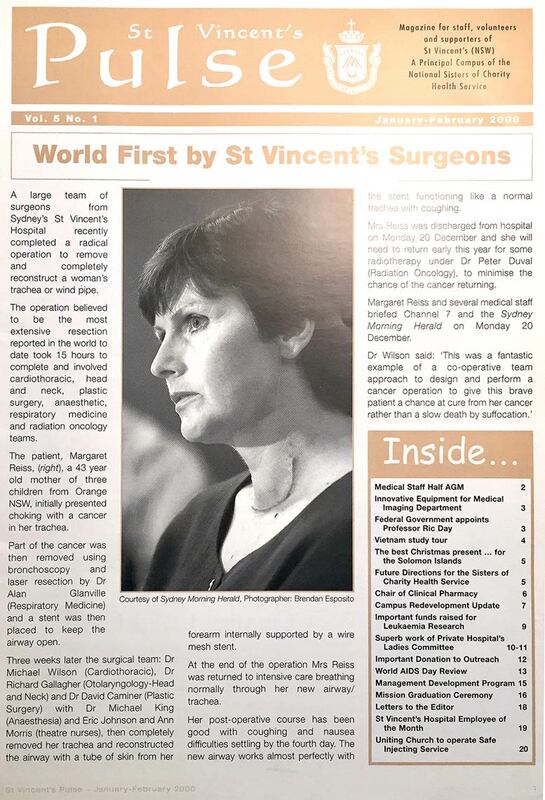 World First by St Vincent’s Surgeons (2000, January/February), St Vincent’s Pulse, 5(1), 1. A/Prof Gallagher performs 22 hours of surgery to remove disfiguring facial osteosarcoma tumour. 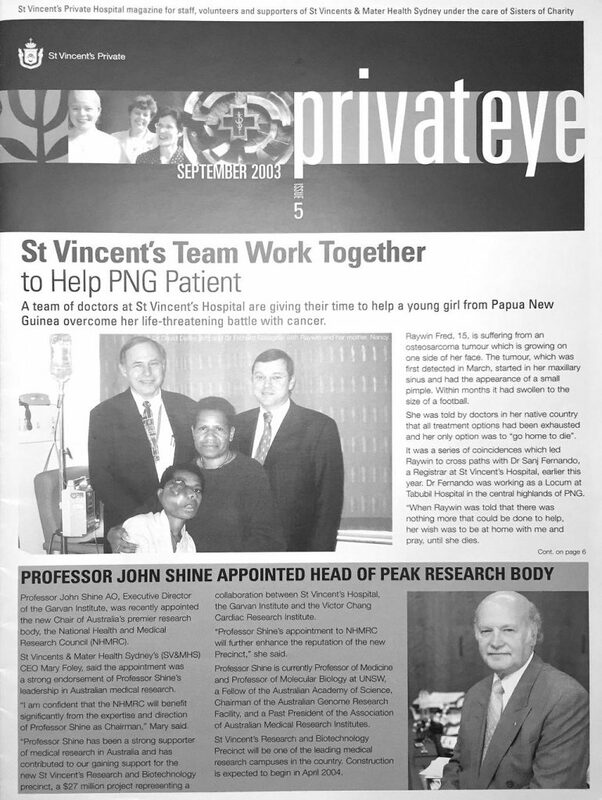 St Vincent’s Team Work Together to Help PNG Patient (2003, September), St Vincent’s Private Eye, (5). Raywin looks forward to going home (2003, September), St Vincent’s Private Eye,(5). Groves, A., Sr. (2003, October 10). [Letter to Richard Gallagher]. Fong, J., Sr. (2003, October 14). [Letter to Richard Gallagher]. The da Vinci robot in managing head and neck cancer. Celebrating Ten Years of Excellence in Robotic Surgery. (n.d.). GP Update, 1, 1-3. Gallagher, R., A/Prof. (2018). 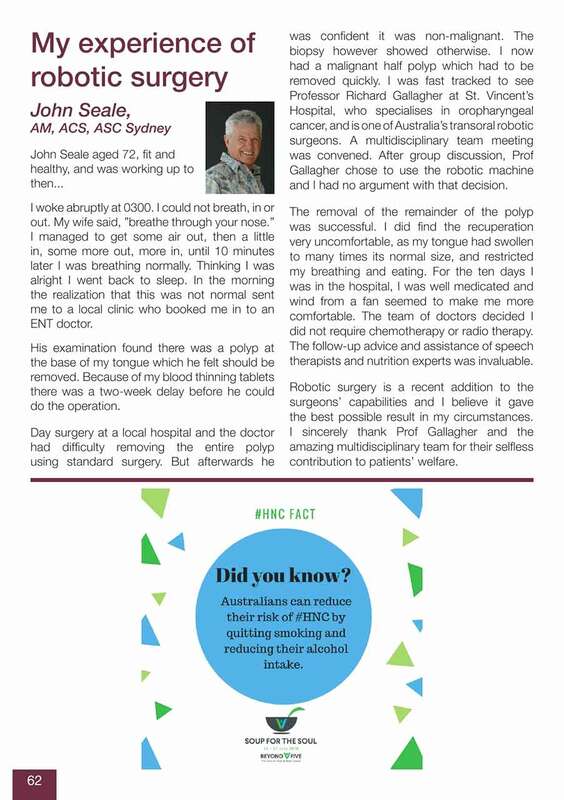 News update: Robotic Surgery. The Swallows Head & Neck Cancer Support Group, 22. Seale. J., AM, ACS, ASC Sydney. (2018). 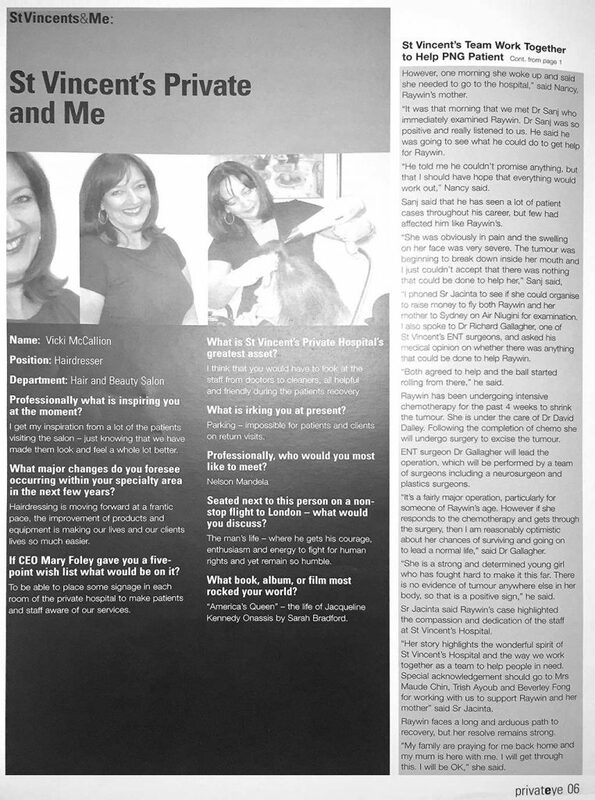 My Experience of Robotic Surgery. The Swallows Head & Neck Cancer Support Group, 62.